Discovery Channel is ready to roll. Today, the network announced season two of Garage Rehab will premiere in January. Season two of Garage Rehab premieres on Discovery Channel on January 8th at 8 p.m. ET/PT. 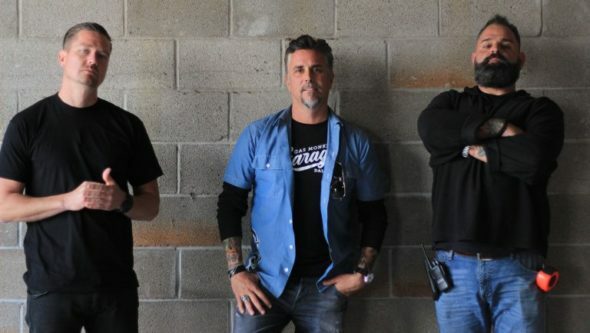 (Los Angeles) – Richard Rawlings has built an empire as the owner of Gas Monkey Garage in Dallas, TX, and last year he set out on a new venture – investing in the transformation of struggling garages across America. Joined by project manager Russell J. Holmes and auto shop consultant Chris Stephens, Richard travels the country to find more shops in need of restoration in an all-new season of Discovery Channel’s hit motor series, GARAGE REHAB, premiering Tuesday, January 8 at 8PM ET/PT. New episodes will continue to air Tuesdays at 9PM ET/PT. What do you think? Have you seen Garage Rehab? Will you watch the new season? More about: Discovery Channel TV shows: canceled or renewed?, Garage Rehab, Garage Rehab: canceled or renewed? I enjoy this show but I am always amazed by Russel and his skill on a forklift. It is very clear that he had never had proper training and as a person who trains forklift operators. I would fail him in a heartbeat. Maybe he should wear a pare of safety glasses once in a while as well.